2011 Oklahoma Superintendent of the Year by the Oklahoma Association of School Administrators. Resume includes 37 years of experience in education. 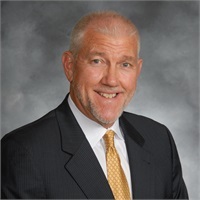 His previous administrative position was assistant superintendent at Woodward Public Schools from 1998-2000. He served as principal at Mustang High School from 1993-98 and assistant principal from 1985-1993. He was principal at Minco from 1981-84, and taught at the school from 1977-1981. Other Accomplishments include past member of Cooperative Council Oklahoma School Administration, Oklahoma Association of School Administrators, American Association of School Administrators, United Suburban Schools Association and University of Oklahoma College of Education Board of Advocates. He is a member of the Board of Directors for the Newcastle Chamber of Commerce and served twice as president. He also serves as an ex- officio member of the Newcastle Education Foundation and a former adjunct professor at Southern Nazarene University.